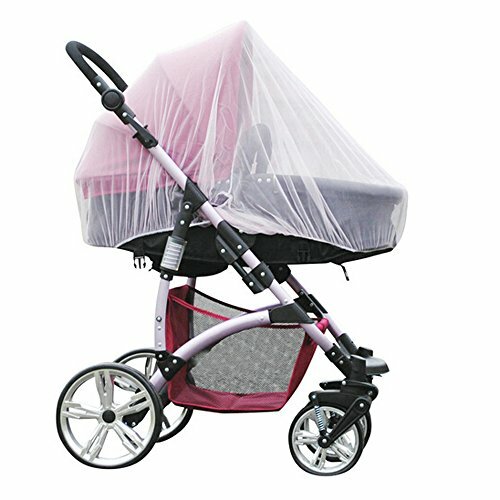 Our Baby Stroller Mosquito Net Diameter： 150 CM. With multi-purpose designed for most baby infant carriers, strollers,bassinets,Cradles ,Cribs,Car seats,Playpens. Elastic band device ensures optimum grip on all models of stroller. Will provide protecting against bugs, bees, mosquitos & flying insects. Keep your baby safe and enjoy outdoor times. mosquito net carseat cover, the mesh allows for air flow and circulation to keep your baby comfortable and cool during use. Keeps insects away while providing shade. Mosquito net for Stroller, No assembly required. On/Off easily form stroller. 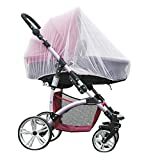 It attaches quickly and securely to the stroller keeping your child protected from bugs. When not use just conveniently tucks away under the seat. Lightweight, foldable and portable, great for traveling. Material: High Quality Polyester Mesh. We choose ultra-light, durable and long lasting construction materials. Gathering around edge.Soft and safe. Insect Bug Netting for Baby Car Seat, Infant Carriers, Cradles . Net Only,not include stroller. We provide 12 months warranty of the Net. It's also can be a gift to your friends. Buy now !